Disney and TOMS have released a Sleeping Beauty collection featuring shoes based off original sketches. Cinderella isn't the only princess with beautiful shoes! Disney and TOMS have teamed up again to release a Sleeping Beauty collection and the shoes are on point! The shoes feature never-before-seen sketches from Disney's all-female Ink and Paint Department that worked behind the scenes on "Sleeping Beauty" and other animated classics from the mid-1930s to 1959. The collection is the second in a trio of collections honoring the female artists with Cinderella shoes already on sale and Snow White shoes to be released in August. For every pair of shoes you buy from TOMS, a new pair will be donated to a child in need. The brand has already donated more than 75 million pairs of shoes to children around the world. Shoe prices range from $64.95-$75 for women and $49-$59 for kids. These products were curated by our "Good Morning America" editorial team. "GMA" has affiliate partnerships, so we will get a small share of revenue from your purchases through these links. All product prices are determined by the retailer and subject to change. By visiting these websites, you will leave GoodMorningAmerica.com and any information you share with the retailer will be governed by its website's terms and conditions and privacy policies. Disney is the parent company of ABC News. So go ahead and chase your dreams in style with these shoe picks! Disney and TOMS have released a Sleeping Beauty collection featuring women's and kid's sizes. These pink Disney x TOMS shoes feature hand-drawn sketches of Princess Aurora and are selling for $64.95. These Disney and TOMS shoes feature original sketches of Sleeping Beauty by Disney's all-female Ink and Paint Department. These alpargatas feature sketches of Princess Aurora's three fairy Godmothers Flora, Fauna, and Merryweather and are selling for $64.95. These Disney and TOMS shoes feature original sketches of Sleeping Beauty's fairy godmothers Flora, Fauna, and Merryweather. These Fairy Godmother Carmel Sneakers are selling for $69.95. 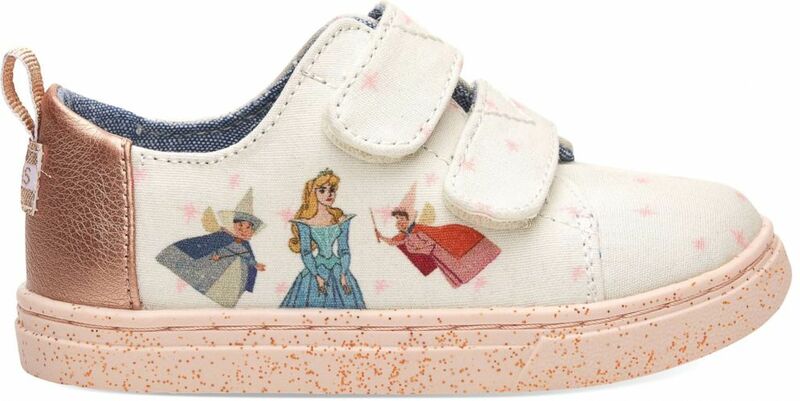 These Disney and TOMS sneakers feature Sleeping Beauty's fairy godmothers. The collection also features shoes for the little princesses in your life and has sneakers in kids sizes. 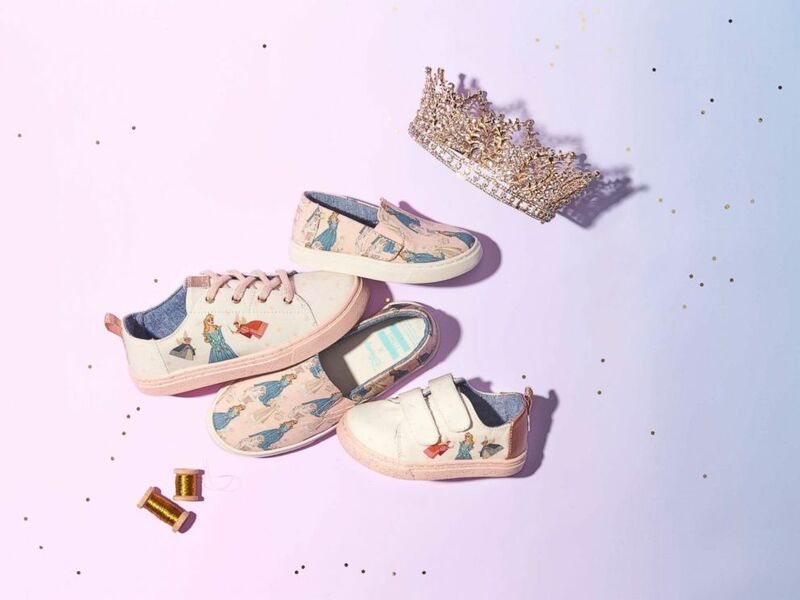 These Princess Aurora sneakers are sold in youth sizes for kids age 5-9 and toddler sizes for kids age 1-4. These Sleeping Beauty sneakers are part of the new Disney and TOMS Sleeping Beauty collection. The Disney and TOMS Sleeping Beauty sneakers also come in kids sizes. These Sleeping Beauty and her Fairy Godmother shoes also come in youth and toddler sizes, as well. The Disney and TOMS Sleeping Beauty sneakers come in kids sizes for the little Sleeping Beauty fan in your life. The Disney and TOMS Sleeping Beauty collection has shoes for babies and toddlers too.